The YKK AP Window Research Institute has just launched its renewed official website on September 6, 2016. The website shares some of the findings from the Institute’s research by delivering high-quality content about windows in the context of various topics such as architecture, art, and culture. 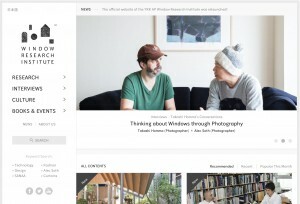 You can enjoy numerous interviews with architects and artists, such as Ryue Nishizawa (SANAA), Sou Fujimoto, Alejandro Zaera-Polo, and Alec Soth on the website. The YKK AP Window Research Institute is a member of the YKK Group, which is engaged in a diverse range of business operations including the fastening products and architectural products. Guided by our belief that “Windows represent civilization and culture”, we have been exploring windows from various academic perspectives together with architects and researchers through our Windowology research since 2007. In 2013, we established the Window Research Institute to further expand our activities. Since then, we have been working to contribute to architecture, cities, and society by bringing attention to the value and potential of windows through organizing publications, exhibitions, and research groups both in and outside Japan.